Northern New England’s choice for quality watches and clocks. We are located in the charming “Old Port” area of Portland, Maine, known for its beautiful architecture and owner operated boutiques. Since 1977 we have been Northern New England’s choice for quality watches and clocks. 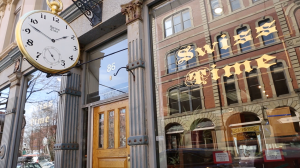 Claude Guyot, Swiss watchmaker, together with his wife Jill and daughter Stephany, have nurtured and developed Swiss Time from a small upstairs trade shop to a street level storefront on Exchange Street. The quantity of inventory and accommodation has risen over the years but the commitment to quality and service remains unchanged. Swiss Time offers contemporary and vintage timepieces. We have the most knowledgeable staff you’ll find anywhere, with one master watchmaker on the premises and two technicians, and very friendly and customer service associates. The soothing tick of a hundred clocks, the brick and wood of our 150 year old interior make our shop a worthwhile destination. “Old World” is a term that has been used to describe the atmosphere here; but that may be contradicted by the state of the art equipment and techniques we employ. This is the shop that you’ve been looking for, emphasizing substance rather than salesmanship. 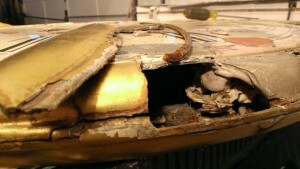 Customers come back because their watch or clock is fixed properly. We are here to stay and we look forward to your visit. The Sign O’er the Door This three-foot pocket watch sign has been marking the location of watch shops since the late 1800’s, first in Vermont, then purchased by Jill’s grandfather in 1912 to announce the opening of R.A. Benedict Jewelers in Norwalk, CT. The business and sign came to Jill’s father in the 1950’s and was moved to Westport, CT. When the store was sold in the 1970’s the old sign traveled back north just in time for the startup of Swiss Time in 1977 in Portland, Maine. In 1998 a significant restoration of the intrepid watch sign occurred with the the addition of painted trompe l’oeil watch works and new gilding by artist Greg Chessaux. In 2014 the sign needed yet another face lift. Years of rain had severely damaged the sign. 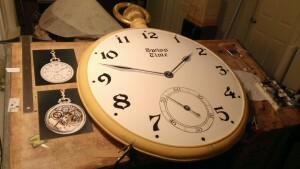 The restoration was completed by Jonathan Leonard with A Sure Sign & Design in Rye, New Hampshire. His undertakings were huge but his end results were extraordinary. Jonathan took the sign back to it’s base repaired the major water damaged areas and gave the good Ole Sign a spectacular face lift. 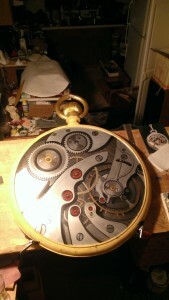 He based his design one of the best American Pocket Watches; a Hamilton Railroad Open Face Pocket Watch. Check his Facebook page: A Sure Sign & Design for all contact information and current projects.